Start the weekend with a FREE ride on the beautiful Appomattox River! Everyone is welcome to come experience Canoemobile in Hopewell! For the sixth year more than 200 students from elementary schools in Hopewell will experience the learning, health benefits, and inspiration that can be derived from a paddle on the river. Many for the first time. 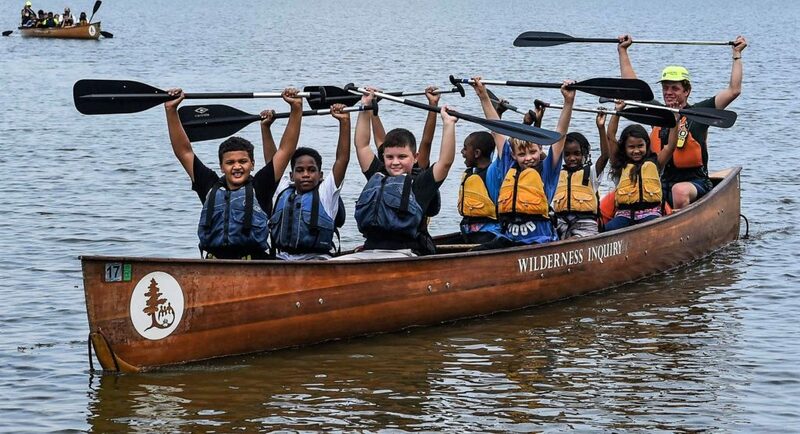 Canoemobile is a roving fleet of six hand-made, 24 foot long Voyageur canoes, that travels across America to bring environmental literacy and dynamic outdoor learning experiences to urban youth. The two day outreach event on Thursday and Friday, October 25th & 26th in Hopewell is provided by Wilderness Inquiry, a non-profit outdoor recreation and education organization from Minneapolis, MN, and sponsored by the National Parks Conservation Association in coordination with the Petersburg National Battlefield. FOLAR has coordinated additional programming to be provided by volunteers from Virginia American Water and the Virginia Department of Game and Inland Fisheries. This year’s free community program is Friday, October 26th from 4 – 6PM at Hopewell City Park, 205 Appomattox St, Hopewell, VA 23860 on the beautiful Appomattox River. Walk-ups are welcome too! This activity is totally kid-friendly!! Come by the park and be ready for fun!